Many people think that you can only grow food in the ground but it very possible to grow food anywhere like a patio or roof. I’ve been growing food on my roof for over 4 years now and have had tremendous success without any previous gardening experience. If done correctly you can produce a whole lot of food on your roof and it’s not that difficult. When growing food on a roof you will need direct sunlight. Several plants can grow in shade but for fruits and vegetables to thrive you will need at least 6-8 hours of direct sunlight and preferably the entire day. You will also need to paint your roof white or install a green carpet which will keep your roof from overheating since a roof top can get abnormally hot and can bake your plants. Since you don’t have dirt on a roof you will need to choose from several options. You can use pots or you can also simply install a raised bed with a few pieces of wood creating a box and fill it up with dirt. There’s no need to put any wood on the bottom so water can just drain out the bottom. This is a great method that I’ve had a lot of success with. 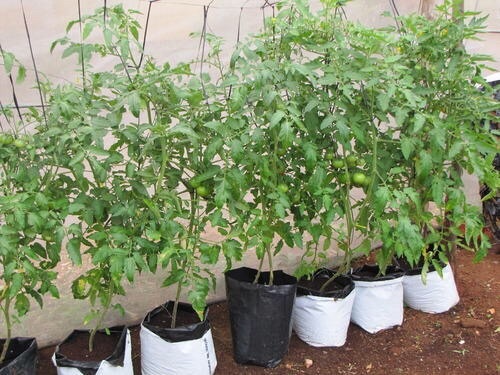 You can also use buckets or grow bags, which are recycled bags that are built super tough and durable and have pre-made holes in the bottom of them for drainage. This method has given me great results and I’ve been able to reuse the same bags year after year. They come in a white color as well not to overheat the plants inside them. This method also saves you tons of money since grow bags are typically 1/10 the price of traditional pots. Since roofs get very hot it will also be very important to water your plants at least once a day when the temperature exceeds 80 degrees and once every 2 days on any other day. If you forget to water your plants regularly you will either kill your plants or stress them out and it will result in your plant not producing properly or bolting prematurely. You will need to choose a good potting soil full of nutrients. It’s important to avoid buying any soils made from Miracle Gro and Scotts which are full of chemicals and manufactured by Monsanto which is a major producer of gmos. The entire idea behind gardening is to do it organically and avoid chemicals and also it’s important to boycott companies that are not providing the people with good sustainable products. Opt for organic potting soils like Dr Earth or…. Also you can add into your potting soil things like earthworm castings, rock dust (azomite), Epson salt, peat moss, coconut core, perlite,vermiculite or homemade compost which helps feed the soil and allow the soil to hold moisture. By adding these things your soil will be full of nutrients so your plants can grow properly and have proper nutrient levels within the soil. It’s important to also periodically feed your plants. After a few weeks most fruits and vegetables will absorb most the nutrients within the pots. You can add in organic plant foods or top dress your plants with epson salt, rock dust or earthworm castings, compost or compost tea every week or two and when you water the plants the nutrients will dilute and go into the soil where the plants can access the nutrients. It’s important when growing your rooftop garden to use good quality organic, non-gmo seeds. Two of my favorite companies to purchase seeds from which are 100% organic and non-gmo are Botanical Interest and Peaceful Valley. There are many others as well. Just check for the certified organic sign or non-gmo on the labeling. When choosing pots keep in mind most vegetables and fruits require plenty of room for the roots to grow. Try to choose from 5 gallon pots all the way up to 20 gallon pots. 1 gallon pots are ok for small herbs and or lettuce but if you are trying to grow tomatoes, peppers, eggplant, and other big vegetables you will need big pots. One mistake many people make is undersizing their pots and then they wonder why their plants don’t do well. The most important thing to know as a new gardener is to research a lot in the beginning. Make sure to read each seed packet you buy. Talk to your local nursery workers and find out what grows well in your region. Many times the local nurseries will sell small vegetable plants for a great price that are designed to grow in your region. Google how to grow certain foods under certain conditions. There’s so much great information on the internet regarding how to grow food in which I learned so much along my journey. Watch gardeners on YouTube who are doing something similar to you. I spent many nights parked in front of the computer watching gardening videos and it was quite entertaining and I learned so many amazing tricks along the way stealing a few great ideas from each gardener. There are many great reasons to start growing your own food. Here’s just a few. It’s an amazing skill that we all should learn. You will become more self sufficient. It provides you with lots of free food. You can end up saving seeds from your garden which is food security. After a few years you can have hundreds of different seeds and have a seed bank. Growing your own food and having a garden makes you feel reconnected to nature. It can be very therapeutic and provide you with a lot of joy and is great at relieving stress. You help out the bees which need all the help they can get. You provide them with food while at the same time they will pollinate your food. It’s also a great way to boycott the system and ensure you are eating truly organic food, free of pesticides. I suggest everyone with a roof and or patio start growing their own food. Once you get started you won’t be able to stop. This is fabulous! I’ll use this link for anyone who asks if there is a way to grow when living in an apartment. Awesome!! ?????? I am interested in growing on my small balcony. I live in GA, I am going to research some things this weekend.